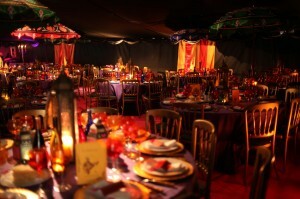 Can we use a marquee for an autumn or winter wedding or a Christmas party? Our marquees can be used all year round due to the reinforced, flame resistant keder system we use when fitting the roofs and walls to make the marquee a sealed unit. The marquee will remain lovely and warm with a thermostatically controlled heating system. The heaters remain outside and out of sight but gently duct warm air into the marquee. You set the thermostat to the required temperature and let the heating system worry about the rest. We can create some of the cosiest effects with our thick rich lining materials, warm colour wash lighting and huge range of carpet colours. A boarded floor is obviously a must through the winter months. Some of our biggest corporate work is done during the winter months along with many Christmas parties and winter wonderland weddings. Will the marquee ruin the lawn? Who sets the furniture out?